Evolutionary ‘trade-off’ between size of throat and testes discovered in howler monkeys furthers Darwin’s theory of sexual selection and corresponds to mating systems: males with larger throats but smaller testes often have exclusive access to females, while those with larger testes share mates. But not all male howler monkeys have been equally endowed. New research on howler species has revealed an evolutionary “trade-off” between investments in the size of the male hyoid – the bulbous, hollow throat bone that allows the howlers’ guttural roar to resonate – and in the size of reproductive organs, namely the testes. The bigger a male howler’s vocal organ, and the deeper and more imposing roar they possess, the smaller their testes and the less sperm they can produce. Researchers found that the trade-off corresponds to the mating systems of different howler species. Males with large hyoids and deeper roars but more diminutive testes live in small social groups with often only one male dominating a number of females – a “harem” social model. Males with bigger testes and smaller hyoids live in large groups with up to five or six males, and females mate with all males in the group. These males don’t have exclusive access to females, and the battle for reproduction is geared more towards “sperm competition”: quantity and quality of sperm. The findings, published today in the journal Current Biology, are a further example of sexual selection say the researchers – a theory first proposed by Charles Darwin in 1871 – and in particular the evolutionary trade-off between “pre- and post-copulatory reproductive strategies”: traits that help males compete for access to mates versus those that help males compete to fertilise eggs. “In evolutionary terms, all males strive to have as many offspring as they can, but when it comes to reproduction you can’t have everything,” said Dr Jacob Dunn, from the University of Cambridge’s Division of Biological Anthropology, who led the new study. “There is evidence in other animals that when males invest in large bodies, bright colours, or weaponry such as horns or long canines, they are unable to also invest in reproductive traits. However, this is the first evidence in any species for a trade-off between vocal investment and sperm production,” he said. In biology, trade-offs are said to exist when one trait cannot increase without a decrease in another. 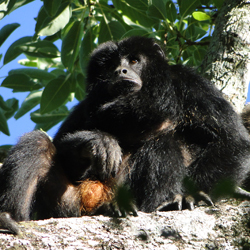 However, Dunn says that it’s not yet clear exactly how the evolutionary trade-off in male howler monkeys works. “It may be that investment in developing a large vocal organ and roaring is so costly that there is simply not enough energy left to invest in testes. Alternatively, using a large vocal organ for roaring may be so effective at deterring rival males that there is no need to invest in large testes,” he said. 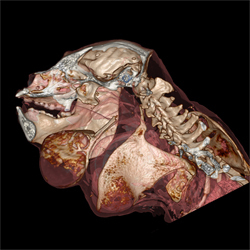 Along with collecting data on the average testes size across howler species, the researchers also used 3-D laser scans to analyse the size of over 250 hyoids – finding a ten-fold variation from the smallest to the largest howler throat bone. The team also conducted in-depth acoustic analyses of a number of howler roars. “The vocal folds of a howler monkey are three times longer than in a human, yet they are ten times smaller than us, with a hyoid bone uniquely adapted to resonate sound and exaggerate their size,” said Dunn. This vocal system means that howlers give the acoustic impression of animals with much larger bodies, and can indeed roar louder and deeper than creatures ten times their size. The unnerving sound of a howler chorus ringing out across forests of Central and South America has long fascinated humans – from ancient Mayans to modern primatologists – and can carry as far as five kilometres through dense rainforest. Charles Darwin was fascinated by the “wonderfully powerful” vocal organs of the howler monkey, despite describing their chorus as a “dreadful concert” in The Descent of Man.